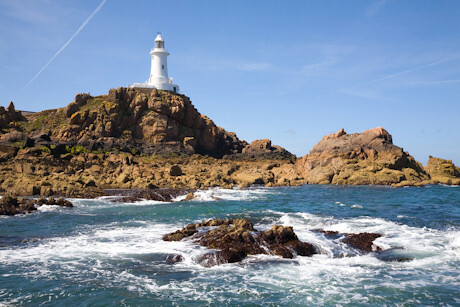 Find out a few interesting facts about Jersey, the largest of the Channel Islands. You can also scroll down to explore our collection of Jersey flag printables for kids. Jersey is the largest of the Channel Islands, off the coast of Normany. Like Guernsey, it is a British Crown dependancy, and Britain is responsible for its defence. Jersey has a long and interesting history. Evidence of Neolithic, Bronze Age and Iron Age activity has been found in many locations, and Roman remains have also been discovered. The Vikings invaded in the 9th century, and Jersey became part of the Duchy of Normany thereafter. When William the Conqueror conquered England in 1066, Jersey was still in Norman hands and therefore came under the English crown. The island has been self-governing since 1204. Jersey was occupied during World War II by Nazi Germany. Jersey has a moderate climate and wonderful beaches, and is therefore a popular tourist location.